Orangeries incorporate a flat roof area, so designers require specialist knowledge of timber and load bearing capabilities. This is one of the reasons why many orangeries are constructed in oak, not only is it an immensely strong timber that can cover wide spans, but it creates a lavish interior when naturally oiled or finished in a clear laquer. The partially flat roof of orangeries surrounding the roof lantern, means that it will be viewed from the upper windows of a property, so it is important that it has an attractive finish. Traditionally, the choice was to use lead, zinc or copper, which while mellowing to a beautiful patina added substantially to the final cost. So we recommend selecting a modern synthetic weatherproof material such as Resitrix with a 30+ year BBA Certification. Automatic aluminium roof vents with oak lined interior. Unlike a conservatory where the weight and load of the roof runs down the rafters and through to the house and side walls of the conservatory, an Orangery Lantern is a ‘dead weight’, typically of between 3/4 and 1.5 tons. Therefore, an orangery needs to be designed carefully with beams sufficiantly strong enough and well supported to ensure it is safe. These beams are either of steel construction or glulam beams. 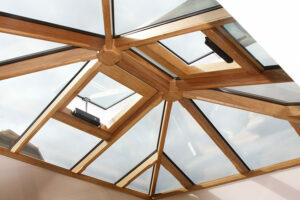 Typically, Richmond Oak use 90mm x 450mm section of up to 8m span, dependant upon lantern shape and weight. For your peace of mind, all of our structures are calculated carefully by a professional structural engineer. Most orangery projects are subject to Local Bulding Control and have to be inspected to comply with building regulations. As well as being structurally sound, your orangery roof must meet insulation standards and typically we use a minimum of 100mm insulation, such as Kingspan or Celotex. 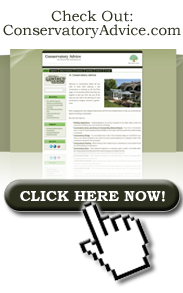 It’s important your roof is manufactured to meet current standards. A good roof lantern will have the highest specification of solar control glass, such as Celcius Elite and it is recommended that it have at least one opening roof vent. For practical reasons, it is recommended that the roof vent be electrically operated, either via a simple rocker switch, or preferably automatically, via a climate control and rain sensor. This will ensure hot air trapped within the orangery can escape and at the same time, create an air flow, in a similar manner to a chimney.